It’s an off week for the Wok Wednesdays crew, but I couldn’t keep away from my wok. After picking up some gorgeous broccoli and cauliflower at the farmers’ market yesterday I came up with this keeper of a recipe. This was originally posted to my personal blog, Green Eats Blog. I’ve excerpted part of the post below and included a link to the recipe. Enjoy! Virtually everything you find at market this time of year can be stir-fried. Its a simple, no-frills way to put a delicious, healthy meal on the table in minutes that also stays true to the seasonal integrity of the ingredients. I stir-fry greens, squash, baby potatoes in their skins, garlic scapes, and more. I never have to worry about coming up with new and innovative ways to use up my haul from the farmers’ market because I know that with my wok at hand, and a few ingredients from my pantry, I can basically make something up on the fly. That is where this recipe for Stir-Friend Spicy Broccoli and Cauliflower came from. I went to the market with the intention of picking up some garlic and onions for a cooking demonstration I’m giving this weekend (read more about my upcoming demos on the Green Eats Events page) and ended up being seduced by some gorgeous broccoli and cauliflower from my friend Jeffry of Seeing Stars Farm. Without knowing what I would do with them (but with faith in my wok) I bought them and never looked back. 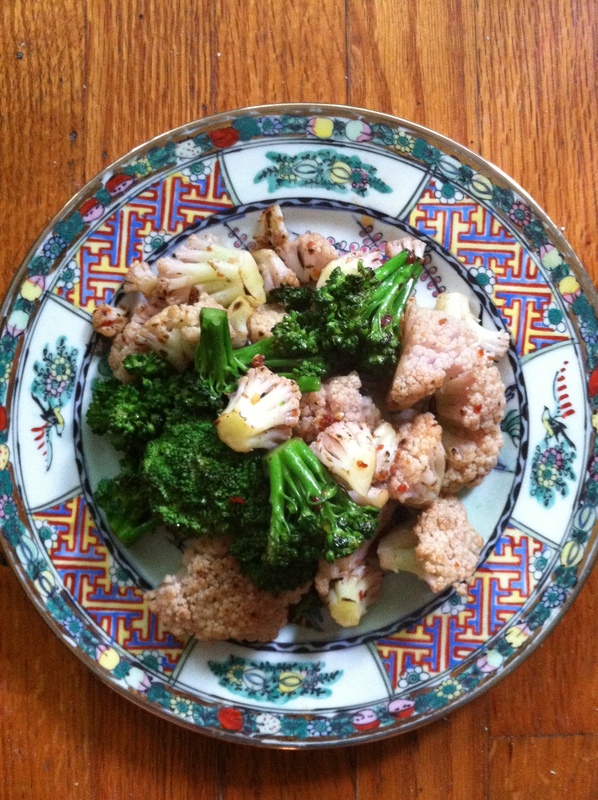 At home the next day, as I prepared for lunch, I pulled out the broccoli and cauliflower with the intention of doing some simple and quick that stayed true to the vegetables. Always a fan of a little heat, I grabbed my jar of chili-garlic sauce from the fridge along with some soy sauce, snatched up a small shallot from the basket on my counter, and….stopped. Nothing else was needed. A quick blanch of the veg and a simple chop of the shallot and I was ready to go.